Marion H. Newton is the seventh child born to Mr. John & Mrs. Annie Newton in Ridgeland, South Carolina. He was reared in a close and loving family and was taught by his parents that you get out of life what you put into it. He attended the public schools of Jasper County, South Carolina. After graduating from high school, he moved to Boston, Massachusetts, and resided there for thirteen years. While living in Boston, he was called into the ministry. Minister Newton was licensed by Bethel Baptist Church of Roxbury, Massachusetts in 1970 and ordained by Rock Spring Baptist Church of Grays, South Carolina in 1971. Heeding the call, he returned to Sumter, South Carolina to attend Morris College. He felt a need to prepare himself to be able to render better service to God and his people. He received a Bachelor of Arts Degree in Liberal Arts and a Bachelor Divinity Degree from Morris College School of Religion. He also completed additional studies at the University of South Carolina in Sumter. On May 11, 1997, he was honored by Morris College with the Honorary Doctor of Divinity Degree in Recognition of Meritorious Christian Service and Inspiring Leadership. The Brick Baptist Church family in Frogmore, South Carolina gave Marion H. Newton the opportunity for his first Pastorate. Later, he went to Meadow Prong Baptist Church of Effingham, South Carolina. In 1982, the Jehovah Missionary Baptist Church Selection Committee in Sumter, South Carolina approved and requested that he come to assume the Pastorate at their church. He accepted this blessing and opportunity to become their Pastor. He is still the Pastor of Jehovah Missionary Baptist Church. The Jehovah church family and the Newton family consider their relationship to be a marriage ordained by God. In addition to his church duties, Pastor Newton was employed at Morris College as Coordinator of Student Activities, Assistant Dean of Student Affairs and Acting Dean of Student Affairs. He served in the capacity of Church Relations and Alumni Affairs Officer from 1987 until June of 1996. At this time, he relinquished his duties at Morris College to provide full time service to his constantly growing congregation at Jehovah Missionary Baptist Church. Pastor Newton is a man of vision, an inspiring teacher and a revivalist. Under his leadership, the Jehovah family has completed two facilities, the Jehovah Child Development Center and the M.H. Newton Family Life Enrichment Center. After six years of their opening date, the Mortgage Burning for the two facilities of 1.5 million dollars was finalized on July 8, 2005. Currently, plans are underway for the third and fourth phases of the initial vision. The third phase will be to build a Sanctuary with classrooms and Administrative offices. The fourth phase will be a Senior Citizen's Care Facility. He preaches extensively throughout the country and is often heard by citizens of local and surrounding areas through sermons, lectures, addresses and newspaper editorials. Pastor Newton understands and accepts his responsibilities to assume leadership roles where he can give assistance to other churches and the community. He often quotes Christ's teaching about accountability found in Luke 12:48 "…For unto whomever much is given of him, shall much be required…"
Delta Kappa Sigma Chapter of Phi Beta Sigma Fraternity, Inc. In recognition of many years of outstanding service to the Sumter community, he became the recipient of the Sumter Rotary Club Centennial Service Award on June 27, 2005. 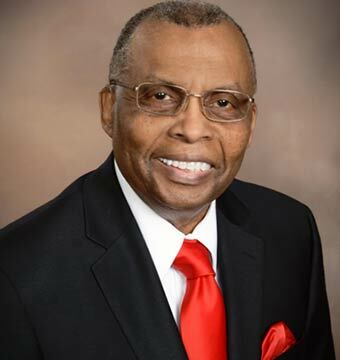 He was also listed in Personalities of the South , on June 22, 2007, he was inducted into the South Carolina Black Hall of Fame, and on July 19, 2009 he was the recipient of the "2009 Men of Distinction" award. Dr. Newton is married to the former Corine Shaw, also of Ridgeland, South Carolina. They were blessed with two daughters: Vanessa and Eyvetta "Maria", and are the proud Grandparents of Steven, Jelissa and Sterling.